Emre Hüner (born 1977 in Istanbul) produces artworks that question the civilized society with all its possible apprehension and the future that's on the extension of the civilization, while acknowledging and analyzing facts grounded in history of science, war, technology, architecture, and so on. 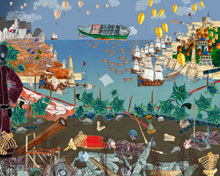 Such grand themes of his works are also reflected in the way the artworks are entitled: for instance, the title of his early yet representative work, Panoptikon (2005), derives from the word Michel Foucault used as a metaphor for the administered, controlled social system ("modern disciplinary societies"). It is an animation work where Hüner alludes to esotericism, history, an indefinite empire and the relationship between humans and nature by presenting a society of mysterious life forms of his own making. 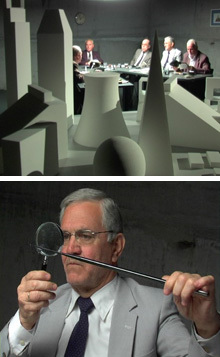 In Quixotic (2011), which describes things that are "tremendously unrealistic," he expresses via a poetic installation work the wild-eyed dreams and experiments of humankind, using as his theme "Fordlandia," the rubber plantation town built in the middle of the Amazon rainforest only to be abandoned. This edition of MAM Project will present Hüner's installation, including Juggernaut (2009), whose title alludes to "an irrepressible, gigantic force," drawing series Black Ships Ate the Sky (2009) and the newly commissioned sculpture Trylon. The show will indicate how science and technology have ironically gone hand in hand with war and excluded the humans in that process by using the symbols of modernity such as international expositions and the automotive industry, aeronautics and combat planes as motifs. This show would surely provide us with a key in reflecting upon the direction of humans and the civilization. * Ticket includes admission to the exhibition "Roppongi Crossing 2013: OUT OF DOUBT" and Tokyo City View observation deck (excludes Sky Deck). The catalogue (PDF version) of the "MAM Project 019: Emre Hüner" is available from here. Video 21 min. 8 sec. Video 11 min. 8 sec.